Nipper never said a word, but he made my point to a “T”. Meet Nipper. How often do you get this look from Mate or children? Whether you have a prepared statement or are improvising, Mate should be able to understand the words coming out of your mouth. What is it making Mate wonder where your voice is coming from? The left side of the brain is for reason and logic, order, stuffy things, like grammar. The right brain controls creative thinking, art and daydreaming. Are you talking to someone who thinks like you? If your idea of painting is Monet and Mate’s is 30-year exterior, you may have a problem. If your idea of order is alphabetized and Mate’s is indoor/outdoor, you may have work to do. If you think in words and Mate thinks in pictures, you need to talk… but differently. Logic and creativity can co-exist. Compromise is the order of the day. Until you can speak to Mate in understandable terms, compromise is impossible. How do you get there from here? This is the easy part. Simple questions, like What did I just say? (sans sarcasm please), go a long way to thinking like Mate and understanding Mate’s position. Stop assuming you know what Mate is going to say. Just stop. Use both ears. Let the words seep into your dominant brain. Then, let them spill over to the other side and soak into the synapses. Read body language. Is Mate watching invisible butterflies in the room? Mate is in the other half of the brain. Go back to the first step. After listening, decide if you should approach the subject from a different angle. I would like the red, platform, peep-toe pump, please. Wait, no shopping. Mate’s shoes! Try on Mate’s shoes. Even if they would fit over yours or crush your feet, try them on long enough to understand why Mate does not understand. As much as we may want to believe Love Conquers All, the stark reality is it does not. Just because you and Mate love one another does not mean you think or perceive the same way. In many respects, this is a good thing. On the occasions when it is not, be certain you and Mate are in the right mind to understand one another. 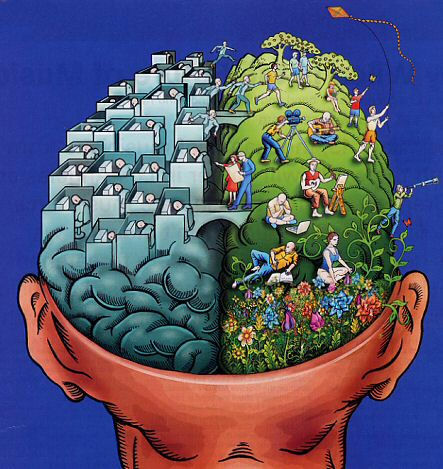 Which brained are you, left or right? I like higher math for those reasons, but have discalculia – a learning disability that effects such things as “lower” (meaning the kind of math most people can do every day) math. It’s another one of those giftedness things I find often occurs – great gifts on one side coupled with disability on the other. I personally thank God for it because I would have been a prideful buffoon if I hadn’t had a few quirks to keep me grounded:) Sorry, this feels like a personal letter lol. Pshaw! I want everyone to feel that comfy here. Not blogging in the judgmental realm. It would be pious and hypocritical of me…I am severely imperfect. It is the only thing which keeps me humble. Red.